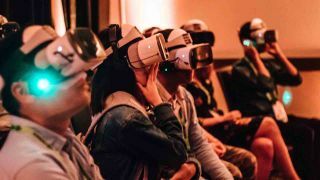 Parallux, a new immersive technology start-up born from NYU’s Future Reality Lab, will unveil a new shared XR technology with the U.S. premiere of its VR short-film, CAVE, at the Tribeca Immersive programming at the 2019 Tribeca Film Festival. Parallux’s core technology, known as the Mass Audience Synchronization Solution (MASS), enables large-scale AR/VR experiences for audiences of all sizes. It allows up to 50 co-located audience members to see and hear immersive content—as well as one another—from their unique point of view within shared virtual or augmented environments. Created in partnership with NYU’s Future Reality Lab, CAVE was designed from the ground up to challenge the status quo of how audiences collectively experience immersive arts and entertainment. During the experience, up to 30 people at a time are transported back to 10,000 BC, when stories were told around a campfire and the history of our ancestors was written on the walls of caves. There, a young woman named Ayara struggles to decide whether to accept her role as Shaman, her tribe’s only link to the spirit world. In CAVE, Parallux addresses the realities of delivering immersive content to mass audiences today, and gives a glimpse into the future. By maximizing the number of people that can share an experience, the piece avoids the low throughput and long waits often associated with location-based VR installations. It also provides a passive, familiar, and less game-like way for its viewers to experience the virtual world.